If it is your friend’s engagement day then it is also sure enough that you’re going to celebrate this engagement ceremony with lots of fun and enjoyment. 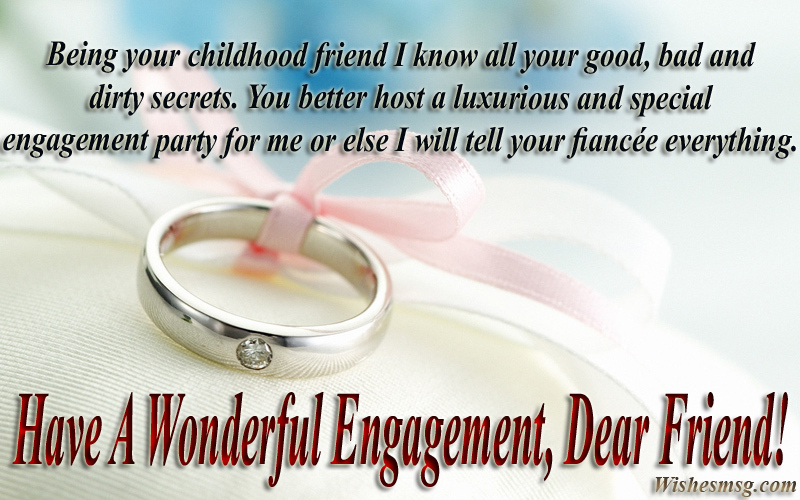 Wish your friend by happy engagement wish or funny engagement message. Let’s get some best Engagement Wishes For Friend from this post which are too awesome to congratulate your friend on his/her engagement. 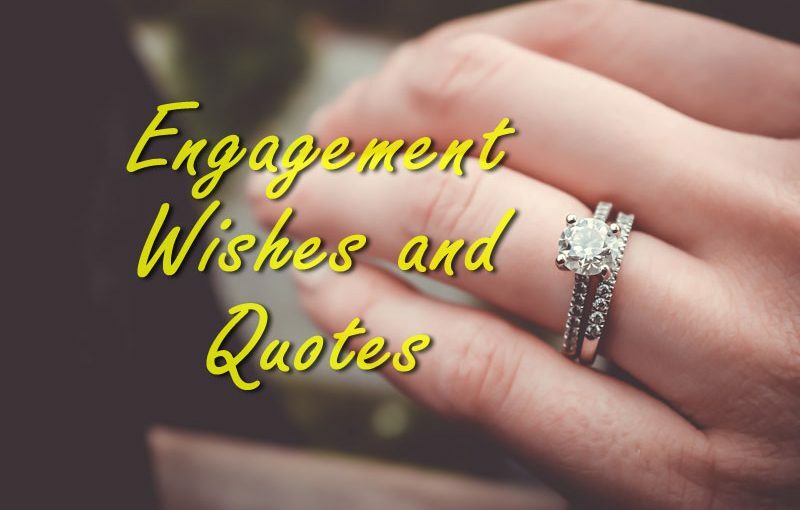 We decorated this post by special engagement wishes for friend along with funny engagement messages, greetings and congratulations quotes to share with your friend’s on their happy engagement. You may share on Facebook, Whatsapp or other social media you use to make him/her happy. We wish you everlasting love. May you be a blessing to each other. Hold on to the love that binds you! What a catch you made for your life! Do call me in on your expenditure days. Have a happy engagement. There have been a lot of emotions from seeing my best friend get engaged. On one hand, I am happy that you found someone that fits you so well. May the Lord guide you in all your plans. As you humbly submit to His commands. To bless and guide you along the way. Cheers on your engagement day! The engagement ring you have on your finger is absolutely stunning. Congratulations on finding a man/woman with such an eye for style. You’re such a lovely couple. We rejoice with you as you celebrate your engagement. May you be blessed in your journey as your take your love into a higher level. Best Wishes! I am very surprise to hear about your Engagement, Congratulation for your new Life. Remember me in your prayer. 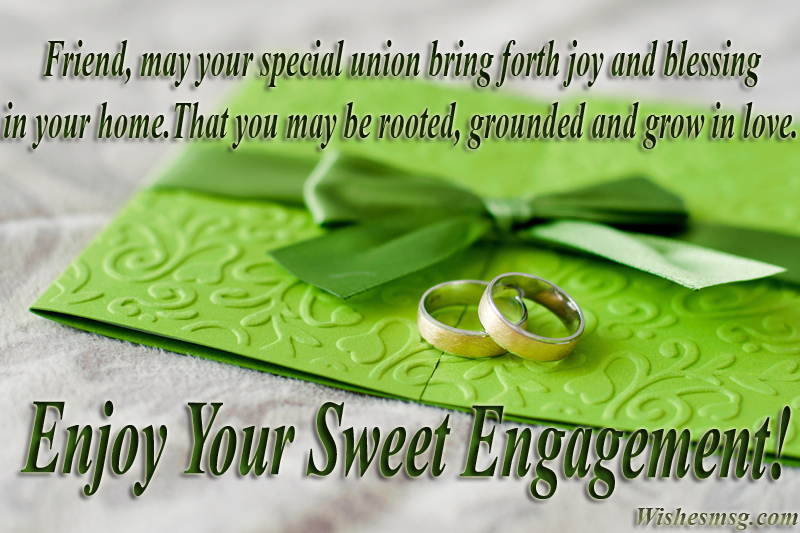 May your special union bring forth joy and blessing in your home. That you may be rooted, grounded and grow in love. Enjoy your sweet engagement! Engagement means to be committed to be engaged with a new person who is going to be yours and you are going to be his/her. Best Wishes to you! You were the first of our friends to start dating, but the last to get engaged. It’s not that you’re a late bloomer, you just waited for the perfect man/woman. Oh my friend! You was waiting for this day which is today, I am with you don’t worry, Congratulations to You. Who cares about your engagement? I can’t wait to go shopping for your wedding gown with you as your bridesmaid. Congratulations. I’m truly happy that you’ve found the perfect girl and gotten engaged. She better know how lucky she is to have snagged a great man like you. Growing up, we always dreamed of our future wedding days and how wonderful they would be. Now yours is finally here! May the day be everything you ever wanted and the life ahead be more than you could have ever imagined. Congratulations, best friend! Being your childhood friend I know all your good, bad and dirty secrets. You better host a luxurious and special engagement party for me or else I will tell your fiancée everything. Congratulations mate. My dear friend, take my cordial wishes for your engagement, I’m not here to attend or hug you for this event but I’m very eager to meet you as soon as possible. Did you know that Engagement is just a promise to get married? Don’t let down your guard yet and keep up all your efforts to woo him until he puts a wedding ring on that finger. Go girl. On your engagement I am celebrating here by giving away all the empty bottles we drank together. From now on, it’s you and your fiancée after all. Have a happy engagement dear friend. Best friend, our friendship has meant the world to me. You’ve always been there for me whenever I needed you. While I never wanted to have to share you, you couldn’t have picked a better person for me to share you with. You two make a wonderful couple. Congratulations! Engagement party, bachelor party, wedding party, anniversary party, kid’s birthday party… wow, your engagement seems to mark the beginning of endless partying. I can’t wait, congratulations. Do you remember when we were little girls playing house with our dolls? Now, you are ready to play house for real, and I couldn’t be happier for you. Congratulations on the engagement and best wishes for the years to come. Friend, I am with you as you say goodbye to your freedom. You have all my sympathy, but don’t expect to be near you as you take your frequent calls from your fiancé. 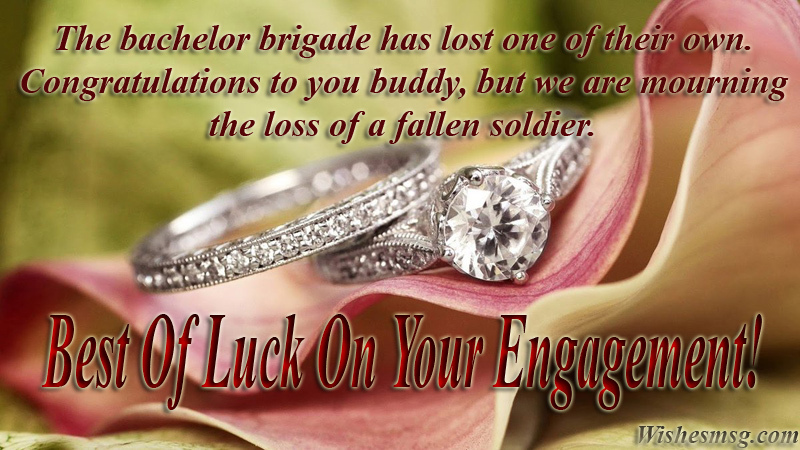 Have a glorious engagement. I heard you are getting engaged buddy. Congratulations on your engagement. I really wish your fiancé gets all wet with champagne when you uncork the bottle for a cheer. On your engagement I am celebrating here by giving away all the empty bottles we drank together. From now on, it’s you and your fiancé after all. Have a happy engagement dear friend. Through this card, I send only wishes and nothing else. Were you expecting a gift too? Sorry the card can carry only a message and nothing else. Have a happy engagement buddy. Cupid took too long to get you both to slip engagement rings on each others’ fingers. Better late than never, I guess. Congratulations. To friend, I wish you a happy engagement ceremony. I hope your partner knows how much you drank last night and not leave you with a glass of wine rather than the engagement ring. Marriage is like a public toilet, those waiting outside are desperate to get in and those inside are desperate to come out. But you shouldn’t be fearful! Friend, I am sad that you took my advice too seriously. I asked you for getting into a relationship, not to devote all the time to that fatso and not have time for me. Have a happy engagement. I am just sad that you fell into the trap. I am still there when you need to hide from that ‘nerd’ fiancé of yours. Have a happy engagement ahead. Congratulations on your engagement! I am so happy to call both of you my friends, and I can’t wait to celebrate with you. Engaged is a synonym for busy. Now you can officially ward off your friends and family from disturbing you because you are ‘engaged.’ Congratulations! Congratulation on your engagement ceremony may you live happily it’s my prayers for you all worlds be in your feet may you have prosperity! May your companionship be strengthened as your love blooms every single day. 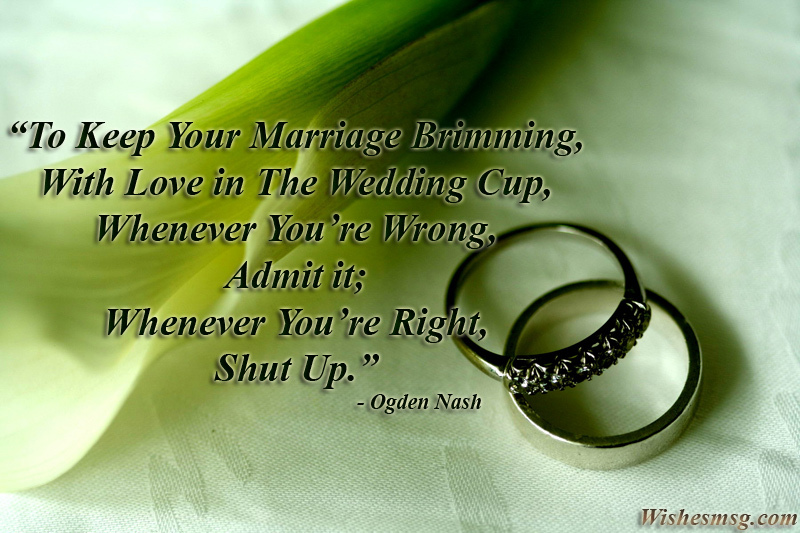 Marriage can be a bumpy ride but you have each other by your side. Congratulations on your engagement. I know your marriage will be as strong and last as long as our friendship. Congrats on your engagement! Engagement mean have care for someone, Care for whom who not live in front of your eyes. Congratulation for your new life. Hearty congratulations on your engagement. Do send me over the ‘champagne and wine’ bottles untouched. After all, I also need to celebrate for a longer period on my friend getting engaged. 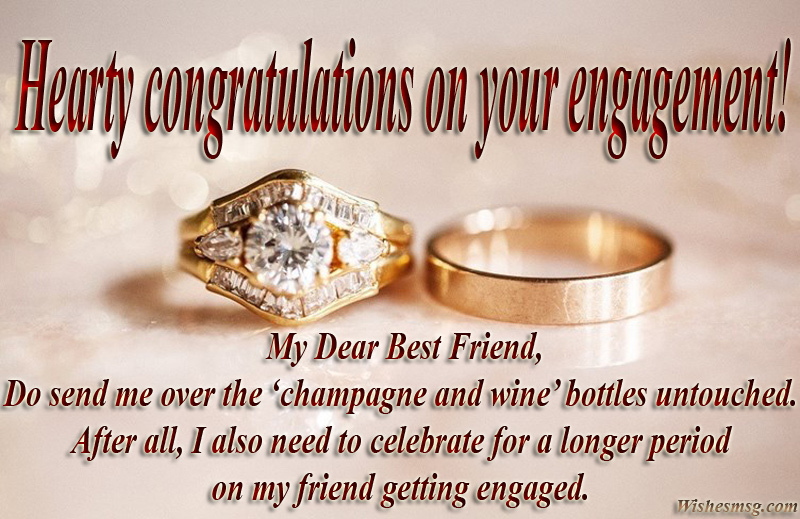 These engagement wishes for friend and funny engagement messages are too amazing to congratulate your friend’s on their happy engagement and your friend will feel happy for having these king of engagement greetings from you.